Sometimes, the grip of winter is broken by a gentle rain. The icy landscape relents to the warm rush, the sky turns from gray to green to blue in the transformation from lost to found, the land moves from death to birth and you can see your reflection in the shallow puddles. Find your well of renewal, and drink until your spirit floats. 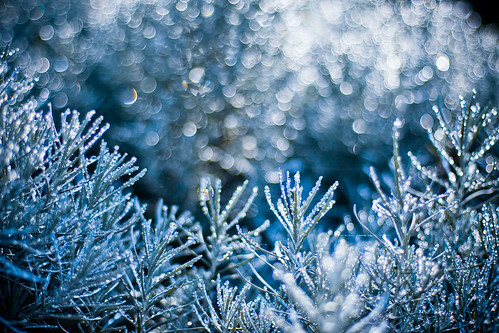 A winter’s rain washing the cold from the ground and the gray from the sky. The hope of renewal and rebirth that comes with the New Year. Time, as precious as it is, to reflect in quiet solitude and find peace in it. ‘Tis the season .. can you feel the tingle in the air? That’s more than just the cold! Spaces around us are humming with human energy and we have a choice to resonate. Find your chord, and strike it loudly. The gift of creativity – discovered, shared and enduring. It is that by which we unfurl our spirit, and it makes the world a brighter place. The cold weather that clings to the leaves of our winter plants and lets us huddle together, giggling like school girls, in front of a crackling fire (and I really hate to be cold). True compassion, a virtue by which we are all touched at some point and a perfect gift for this holiday season. Welcome back to Three Thanks. This is the first official Monday post; I’m glad you came back. If this is your first visit, you can catch up quickly here, or simply read the About page and join us. Today, my heart is heaped up with gratitude for these things. 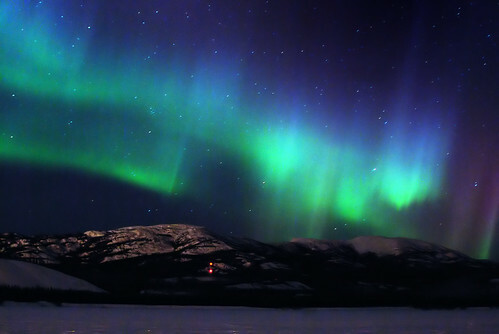 The beauty, mystery and magic of the Aurora Borealis – the Northern Lights – and all that they inspire. An authentic belly laugh, shared with a colleague. This morning I woke up feeling just a little off. I stood staring aimlessly out the window at the gray and gloomy landscape; the cold air crept around the window sill and wrapped around my neck making me shrug my shoulders in defense. I felt downtrodden and thought briefly about going back to bed. Just then, my cat lowered her head and leaned into my leg with a thud and uttered a raspy good morning meow. I looked down at her, said “thanks” and then I smiled. We walked together over to the computer together and as I am oft to do, started meandering around the web. The first post I clicked through to was this one: Better Mood from Gratitude: 2 Minute Execise – Start Now! The post has evidence showing that gratitude, expressed in simple form on a weekly basis, increases your happiness. Seriously? I sat staring at the page, mindlessly scratching my cat behind her ears. “I have to do this”, I thought. Three Thanks is a place for us to simply jot down three things for which we are thankful every week. Simple things are often the hardest to do, so I hope we can do this together. We’ll have a post up every Monday morning to get it started, and sometime over the week you’ll reply in the comments with yours. Don’t overthink it .. we’ll be here every week. Just jot down three thanks and we’ll look back in a year happier, trust me.